Pumps in stainless steel AISI 304 with "vortex" impeller. When the impeller turns, it creates a vortex pushing the water through the pump body. As the impeller is positioned in the upper part of the pump body it permits a wide free passage for the solid parts contained into the water. Thanks to their light weight these pumps are ideal for small drainages when it is necessary to move the pump frequently. 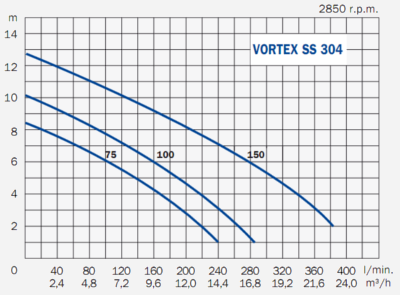 The VORTEX SS 304 are usually installed into houses' cellars to drain the rain water or the domestic sewage water. These models cannot be used to pump heavy sewage water or water containing stones. Impeller Back open impeller "vortex" type. Mechanical seal Double mechanical seal in oil chamber. The lower one in silicum carbide / silicum carbide / NBR, the upper one in silicum carbide / graphite / NBR. Electric board Model F5-0.5/3-1 for single-phase pumps or model F6-0.5/10-3 for three-phase pumps. The electric board provides a manual reset thermal protection to protect the motor of the pump and it permits the connection of a float-switch. 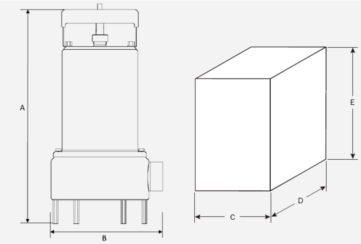 In the three-phase pumps (that have no protection built-in into the motor and without the possibility to connect a float-switch directly on the pump) the electric board is mandatory.